High-water mark from the October 2015 flooding in Columbia, South Carolina. The photograph was taken by U.S. Geological Survey personnel on October 8, 2015, from a home near Kinley Creek. The U.S. Geological Survey (USGS) has thousands of real-time water-monitoring sites throughout the Nation that record continuous stream stage (height of a river) and streamflow (how much water is flowing). This network of gages is invaluable during floods and high water to allow the general public and emergency responders to know where dangerous flooding might be occurring. Documenting the peak height of high water is important information for historical purposes and for planning future development alongside rivers. At places where the USGS does not have real-time monitoring equipment we have to either be at the site at the exact river peak (unlikely), or visit the site afterwards and look for visual clues of peak stream height. Using surveying equipment, we can "run a level" to a known USGS gage-height altitude point and come up with the peak gage height the stream reached during the storm. Once that is known, the USGS can estimate the maximum streamflow during the flood and know the recurrence interval of the flood event. Hydrologists often visit streams after a large storm to check for high-water marks. If, for example, records show that stream stage reached 17 feet during a storm, a high-water mark will show the hydrologist what a stage of 17 feet means in terms of how high the water was on the riverbanks and surrounding land. This information can be used to estimate how much land alongside a stream will be inundated at various stream levels. This kind of information is valuable in developing maps and information concerning the impact of floods on the adjacent landscape, structures, and people. Below are a couple of pictures of Peachtree Creek in Atlanta, Georgia. The pictures were taken on the river bank next to Peachtree Creek a few days after high water occurred during a storm. USGS hydrologists visited the site to try to find out the peak river height during the storm. High-water marks are visible in both pictures, although a hydrologist would only regard one of the marks as being reliable. Find the high-water marks in these pictures. Here are a couple of pictures of Peachtree Creek in Atlanta, Georgia. The pictures were taken on the river bank next to Peachtree Creek a few days after high water occurred during a storm. USGS hydrologists visited the site to try to find out the peak river height during the storm. High-water marks are visible in both pictures, although a hydrologist would only regard one of the marks as being reliable. Did you find them? The pictures below are close-ups of the high-water indicators in the top pictures. Were you able to spot them? The left picture shows a poison ivy vine with the bottom leaves covered in dried mud. The line where the mud stops indicated where muddy stormwater was flowing, and, thus, how high Peachtree Creek got during the storm. The right-side picture shows a limb that hangs over Peachtree Creek. During a flood, rapidly-moving water carries leaves, straw, and even whole trees! Wet leaves get stuck on limbs that are partially submerged in the stream. When the stream recedes the leaves remain on the limbs. The top of the leaves and pine straw indicate how high Peachtree Creek was during the storm. The mud on the poison ivy vine is a much better high-water mark than the tree limb, though. During high water, part of the tree limb will be submerged in the fast-moving water, which will cause it to move up and down. Hydrologists would not use this type of high-water mark to estimate peak stream stage during a flood. How are high-water-mark data used? As with most major flood events, the USGS partners with the Federal Emergency Management Agency (FEMA) and other state and federal agencies to flag and survey HWMs elevations in areas that were flooded to determine the extent and severity of the flooding. The data associated with HWMs have many different uses and the location of the HWM plays a role in how the information is used. High-water marks connected to inland river flooding and coastal flooding can be used for future flood forecasting, predicting the severity of future floods and also for delineating the FEMA floodplain maps. High water mark data collected after storms and hurricanes allow FEMA to revise its current maps for the affected areas. This data is also part of the flood frequency calculations that FEMA uses to identify areas that are likely to experience high water in the event of a flood that has a 1 percent chance of happening in any given year. These floods, known as 100-year floods, serve as the foundation for flood management planning. 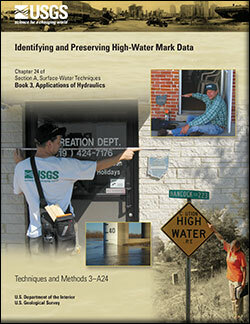 Another significant use for these high-water marks is the USGS Flood Inundation Mapping effort. A flood inundation map shows the extent and depth of flooding that occurred in various communities as a result of a major storm or flood event. Inundation maps are one factor used to determine where changes should take place in building codes to help communities be more resilient; where evacuation routes should be; where (and how high) a bridge or road should be; and other community planning efforts. Once these flood inundation maps are complete, they will be documented in a USGS-series report and the associated data will be publicly available online.